ClearSpan structures are an appealing and cost-effective solution for indoor sports complexes and athletic buildings. ClearSpan fabric buildings utilize a solid engineered truss system to provide exceptional height and extraordinary clearance. You’ll never have to worry about low ceilings interfering with your game. There are no internal support columns to cut down on athletic space or to obstruct players and spectators. ClearSpan Hercules Truss Arch Buildings also provide exceptional acoustics, leading to a more enjoyable sporting experience. ClearSpan can design, build and install athletic facilities of numerous widths and lengths to meet any athletic or municipal requirement. ClearSpan’s spacious interiors can be completely customized, and whether it’s football, soccer, baseball, tennis, lacrosse or anything else, ClearSpan has mastered the indoor arena experience. 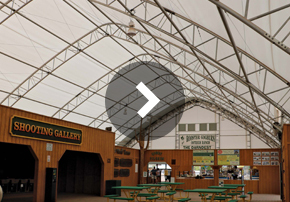 The quality and durability of the ClearSpan fabric and frame means a longer lifespan with lower construction costs. 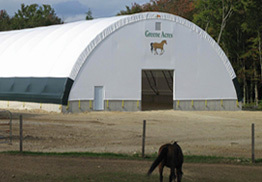 When a ClearSpan building is equipped with a fabric cover, the monthly savings can be dramatic. This, combined with the buildings’ temporary nature, creates incredible lighting and tax savings. ClearSpan structures offer superior air quality compared to traditional wood or steel buildings. Natural light from the fabric cover further helps by eliminating bacteria, humidity and mold. Situated on 220 acres of ranch land northwest of Boise, the staff at Cherry Gulch was looking to expand its recreational activity programs. Outdoor facilities are ideal for various games and team building activities, but they also wanted to provide the students with year-round recreation in an indoor gymnasium. “We’ve been utilizing an outdoor basketball court for all of our programs,” explained Program Manager Kahn Borge, L.M.S.W. “We wanted to give our students the opportunity to play sports and enjoy other activities with an indoor facility during inclement weather.” After exploring different building solutions on the Internet, Cherry Gulch ultimately selected ClearSpan Fabric Structures due to its affordability and durability. “We selected ClearSpan because of the combination of low cost and quality,” Borge added. The 65’ wide by 100’ long Hercules Truss Arch Building was installed using ClearSpan’s in-house anchoring system. The 10’ long Helical Anchor foundation allows for minimal excavation and rapid installation of the structure. What’s more, the spacious interior has allowed the faculty at Cherry Gulch to use the indoor gymnasium in more ways than initially planned. “The building has been great and the students love it,” explained Borge. “We’ve also found that aside from recreational activities, we are also using the building for large training sessions.” In addition, Cherry Gulch also chose blue and orange for their gymnasium floor to emulate the colors of the Boise State University Broncos, which is known for its blue turf football field at Bronco Stadium. Our sports arenas come in fabric, hybrid and metal buildings, ensuring that no matter how you plan on using your ClearSpan structure, there is an ideal option.